Bon monastery in Solan is the second oldest Bon monastery in the world. The monastery is highly revered by the people of the Bon community. The Bon community is even older than the Buddhist community though the principles are the same. Perched on a hill top, the Bon monastery offers picturesque views of the town and snow-capped mountains. 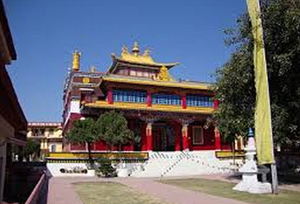 The monastery is a grand spectacle, boasting manicured gardens and an impressive statue of Tonpa Shenrab Miwoche. The monastery was founded in 1969 by the Abbopt Lungtog Tenpai Nyima. The chief of the monastery is Menri Trizin. People participate in religious ceremonies and it is also a ritual to walk in a clockwise direction around the monastery.